Hello and welcome, sweet friends. I'm so glad you are here. Do you know how some things just take your breath away and are all-encompassing?! I love those things and sometimes I really prefer just a little bit of wonderful. Every week you link up your incredible creations and I find more and more that there is truly something wonderful about each thing you share. So this week I'm celebrating those little bits of wonderful that caught my eye. or Mary from the Boondocks Blog's How to Make Pretty Pleated Curtains with DropCloth Just LOVE these, and they are so frugal! You'd never know to look at them. Simply elegant! 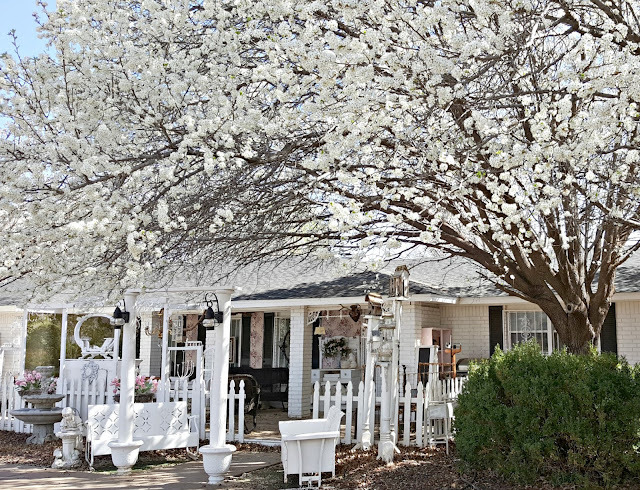 Penny's Vintage Home is In Full Bloom and she shared it with us! I Love the blooms. Just heavenly. 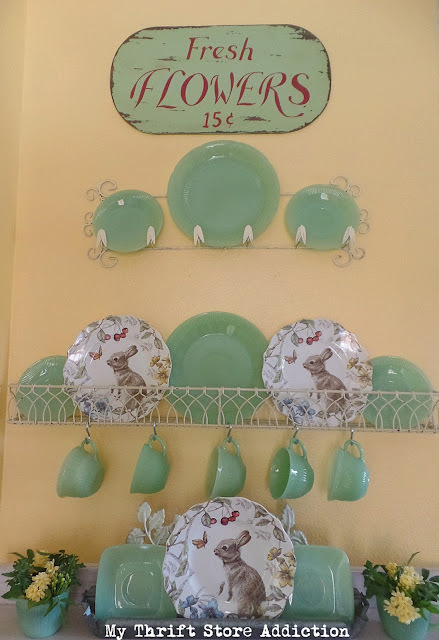 Cecilia from My Thrift Store Addiction shared her simply adorable Springtime Kitchen Vignette. Stunning! 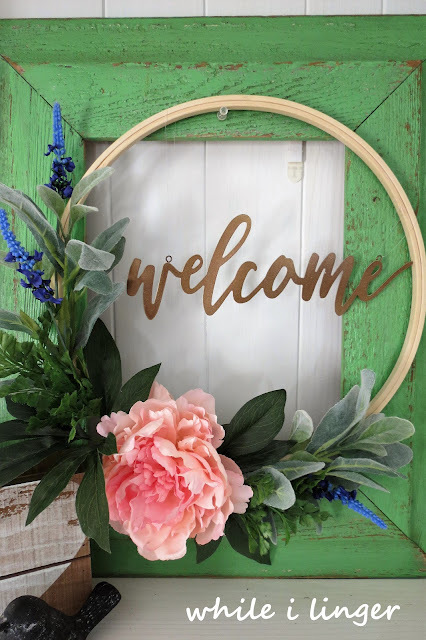 Jolena from While I Linger gave us her Spring Hoop Wreath Tutorial. I love how her sweet wreath turned out, don't you?! I loved it Penny! Thank you so much for sharing with us! 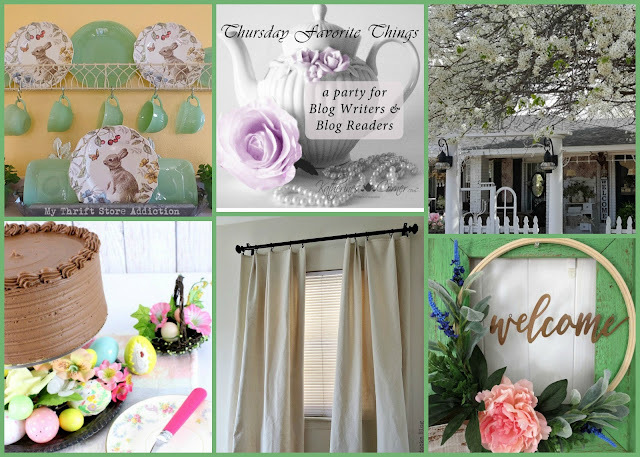 Thank you for featuring my spring hoop wreath. I love all the beautiful features this week! Jolena, it was my pleasure! Love your little Spring Wreath! Thanks for sharing with us! Theresa thank you so much for the feature. I am enjoying those curtains as I type. Hope you have a great rest of the week. Thanks for the feature and for hosting. Have a wonderful evening! Theresa, thanks so much for the feature & for the party! The Bearded Hiker #23/Roast Beef Poboy - Great stuff, those Nigerian Beef Kabobs have really caught my attention! Definitely need to try that! April's Ruby Is Out and You Are Going to Love It!